Denosyl contains SAMe (S-Adenosylmethionine) to help support liver and brain health. It is available in enteric-coated tablets for dogs and cats and tasty chewable tablets for dogs. The chewable tablets of Denosyl allow dogs to receive SAMe in a tasty form eliminating the need to "pill" your dog daily. 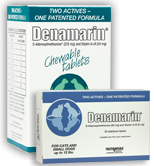 Additionally, the chewable tablets are absorbed more quickly when compared to enteric-coated tablets. Advanced technology in the exclusive NMXSS75® S-Adenosylmethionine found in the chewable formulations provides stability, eliminating the need for enteric coating or foil-on-foil blistering. The chewable tablets for dogs are tasty, single size and scored for easy administration. Because the tablet must be kept intact to prevent destruction by moisture, administration range is based on the nearest whole-tablet. The chart below is provided as a guide for administration. Daily administration may also be calculated based on 20 mg/kg of body weight and rounded to the closest tablet size or combination of sizes. For optimal absorption, tablets should be given on an empty stomach, at least one hour before feeding, as the presence of food decreases the absorption of S-Adenosylmethionine. Studies have shown that, in many cases, tablets or capsules given as a “dry swallow” do not pass into the stomach in cats but may become lodged in the esophagus. It is recommended for pet owners to administer 3-6 cc of water immediately following any tablet administration to speed passage of the tablet into the stomach.10,11 Denosyl 90 mg tablets are ideal for cats because of their small size. If the pet is to receive more than one tablet daily, the total number of tablets may be divided between morning and evening for ease of administration. For example, a daily administration of three tablets could be divided into two tablets in the morning and one tablet in the evening. *The number of tablets can be gradually reduced or increased at any time depending on the pet's needs. Store in a cool dry place. Keep tablets in original blister pack until used. Tablets are sensitive to moisture and extreme heat. The chart below is provided as a guide for administration. Daily administration may also be calculated based on 20 mg/kg of body weight and rounded to the closest 1/2 tablet size. For optimal absorption, tablets should be given on an empty stomach, at least one hour before feeding, as the presence of food decreases the absorption of S-Adenosylmethionine. For dogs over 60 lbs., give ½ chewable tablet for every 15 lbs. of body weight. Example: a 75 lb. dog is given 2½ chewable tablets. What formulations of Denosyl are available? 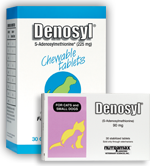 Denosyl is available in two formulations for your convenience: original enteric-coated tablets for cats and dogs and tasty, scored chewable tablets for dogs for easy administration. How much Denosyl should I give my pet? Your veterinarian will advise you as to the amount to initially administer. Depending on your pet’s response and status, your veterinarian may eventually adjust this amount to meet your pet’s individual needs. Remember, Denosyl enteric-coated tablets should not be broken. When increasing or decreasing their administration, adjustments should be done in full tablet increments. Some pets are given Denosyl only for a short period of time, although Denosyl may be used longer in other animals. What should I look for when I give Denosyl? While response varies, owners may note a change in their pet’s appetite, activity, and attitude. How will my veterinarian monitor my pet's response while on Denosyl? Your veterinarian will likely recommend follow-up examinations, blood work, and/or other laboratory work to check on how well your pet is doing with Denosyl and how it may be helping to support your pet’s liver function. Denosyl has been shown to be well-tolerated by both dogs and cats with a wide margin of safety. Can Denosyl be used with other products? Yes, your veterinarian may recommend combining Denosyl with other products and/or dietary modifications. One such product is called Marin® Plus, which can be administered with Denosyl for additional liver health support. There are no known adverse interactions of Denosyl with drugs or other supplements. Denosyl may even protect against negative effects on the liver caused by some medications. Are other brands the equivalent to Denosyl? While other S-Adenosylmethionine (SAMe) products are available, there can be a significant variance in product quality and activity levels of SAMe. Denosyl is produced using high-quality, researched ingredients and under strict manufacturing standards. Since S-Adenosylmethionine is made from methionine, should I give my pet methionine? Administration of methionine is not recommended. Providing high levels of methionine to pets with liver compromise may not increase the production of natural S-Adenosylmethionine and has been shown in some cases to increase liver damage. SAMeIncreases levels of glutathione which is an important compound protecting liver health. 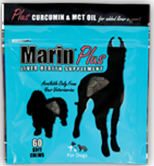 Silybin The silybin found in Denamarin and Marin Plus for dogs is complexed with phosphatidylcholine which has been shown to increase absorption 4x in dogs compared to standardized milk thistle extracts. Vitamin E An antioxidant that has been shown to help protect liver function. 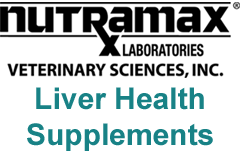 Zinc Supplementation may be beneficial in dogs with long-term decreased liver function as these dogs often have low liver zinc levels. Zinc participates in many enzymatic reactions within the body, and any deficiency may have harmful effects. Zinc is not in Marin for Cats as deficiencies have not been noted in cats. Curcumin Curcumin has been shown to inhibit several mediators, supporting a healthy inflammatory response. It also helps increase production of glutathione, the liver's main antioxidant and “detoxifier” and protects against fibrotic changes in the liver. Medium Chain Triglyceride (MCT) Oil In the liver, MCTs can be used for energy for metabolic reactions. MCTs can also help reduce fat deposition, which may occur in the liver secondary to compromise.